When you understand the true meaning of love, you will go beyond its physical expression. 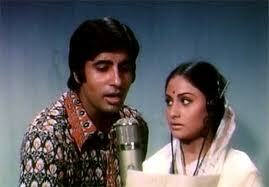 Yesterday, I watched ‘Silsila’ (Yash Chopra, 1981, Amitabh Bachchan, Jaya Bachchan, Rekha, Sanjeev Kumar) one more time. It’s a story of complicated relationships and of the people who are entangled in them. The movie made history not only because of the onscreen chemistry between Amitabh and Rekha but also because of the much rumored offscreen affair between them and the stresses between Amitabh and his onscreen wife Jaya (his real Life wife too). In one scene, in the iconic ‘Holi’song ‘Rang Barse’ (sung by Amitabh Bachchan himself), Amitabh hugs and kisses Rekha, much to the shock and dismay of their respective onscreen spouses, Jaya and Sanjeev Kumar – and to the surprise of the audience. While contextually, the hug and kiss are meant to only be a bold expression of the Amitabh-Rekha onscreen romance, there can be a spiritual interpretation to it too! Here’s a Zen story, that I recall, to illustrate the point. Twenty monks and one nun, called Eshun, were practicing meditation with a certain Zen Master. Eshun was very pretty even though her head was shaved and her dress plain. Several monks secretly fell in love with her. One of them wrote her a love letter, insisting upon a private meeting. The import of the story is that if you love, love openly. For long society has suppressed love. It is natural, it is human nature, for people to love other people. But society has placed a restriction. For ages now, society has proclaimed that you cannot love more than one. And that restriction has come about from what society has created again – the institution of marriage. Religion has made this even more complex and intimidating by introducing the concept of sin. So, if you love another when you are married to one, it is both illegal and a sin. This is because the meaning of love has been distorted. Love has come to mean something conditional – almost everyone is saying, at least through implication, that if you behave within the contours of a relationship, you will be loved by me. So, Eshun’s open invitation in the Zen story, and Amitabh’s ‘daring’ act in the ‘Rang Barse’ song may alarm many. But, however difficult it may be to immediately relate to it or accept it, the truth is that it is they who personify true, pure love. As human beings, our true nature is love. We don’t have to do anything to love or be loving or become loving. We just have to tear down all the walls we have allowed to come up between us and our expression of love. Then love will transcend the physical plane and break through social barriers. Then we will love openly! A goose in a jar, Jai’s death in Sholay, and a lesson in being happy! When you step back and witness your own Life, objectively, dispassionately, you can then find bliss even in a tragedy or catastrophe. When you are in the throes of a big crisis, when you don’t see a way out to end it, take a deep breath, step back and watch the situation with the eye and view of an observer. Be a witness. Don’t participate in the situation by thinking, by worrying, by attempting to solve it! Just watch the crisis, your place and role in the situation, and let an awakening happen within you – that enlightens you! A Zen Master once gave his disciples a ‘koan’ to deal with. A ‘koan’ is a paradox to be meditated upon that is used to train Zen Buddhist monks to abandon ultimate dependence on reason and to encourage them into gaining sudden intuitive enlightenment. The ‘koan’ given here was the one of a goose within a jar. When the goose was small, the task was to simply feed the goose. Soon the goose grew big. And was barely fitting in the jar. Now the task was getting the goose out of the jar without either breaking the jar or killing the goose. Disciple after disciple kept thinking of achieving this task by looking at the situations from different angles. Each of them concluded that it was impossible. They saw it possible only if the jar were to be broken or the goose was killed. Now, neither of these actions was allowed. They gave up. But one disciple persisted. He too was tired of examining the situation from every conceivable dimension. He too wanted to give up. That’s when he concluded that his Master may not have recommended this situation without a reason. In a flash, it occurred to him that the Master was perhaps not interested in either jar or the goose. The Master wanted the disciples to learn something else. He recognized that the jar represents the human mind. And the goose represents you – the individual. He concluded that the Master wanted them all to understand that to experience bliss, the ‘you’ goose must detach itself from the ‘jar’ mind. Zen Masters have taught that the mind is at work 24×7. It is eating you up all day with thoughts of worry, anxiety, anger, fear, insecurity and hatred, among many, many more. Now, in a crisis, unless you realize that you are like the goose in the jar, and stop believing that you were ever stuck in the jar, you cannot feel freedom. For this to happen you have to step away from the problem situation and merely ‘witness’ or ‘observe’ it. If you don’t do this, your mind will continue to hold you hostage and keep you trapped. A mind at work, or being controlled by the mind, means being susceptible to misery. The mind is a procession of thoughts. Like a full length movie. The thoughts are like the characters or the actors or the locales in the movie. The key is to not to identify yourself with these thoughts – the characters or the actors or the locales. Because once you identify yourself, you will get stuck with both the beautiful and the terrible moments in Life – as in a movie. As a young boy when my parents took me to watch ‘Sholay’ (Ramesh Sippy, Amitabh Bachchan, Dharmendra, Hema Malini, Jaya Bhaduri and Amjad Khan) in a New Delhi cinema hall called Rachna in 1975, I remember I refused to come out of the hall when the movie got over. 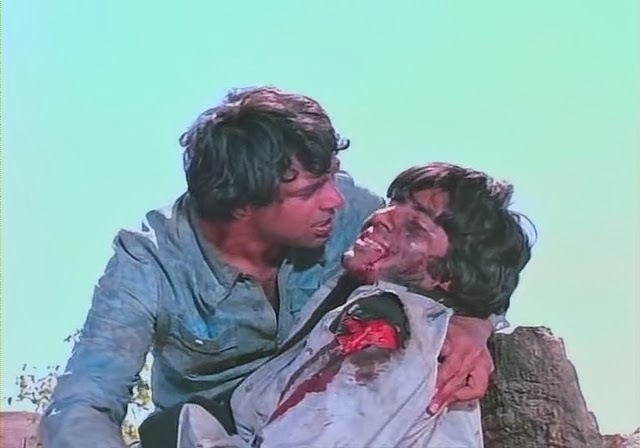 I was grief stricken that Jai (Amitabh Bachchan) was dead. I had come to identify with him. It was only when my dad sat me down and counselled me that the ‘real’ Amitabh Bachchan was still alive, and this was just a movie, did I understand and, therefore, went home with my parents! 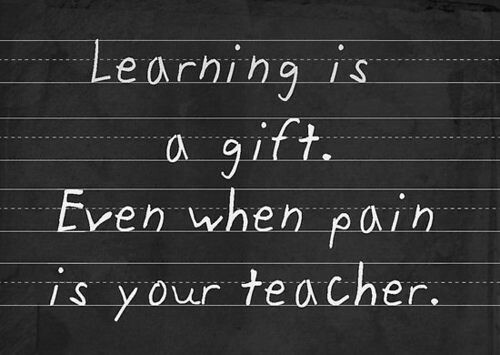 Many of us are in so much grief with our Life situations. This is because all of us are like that goose or like I was after watching ‘Sholay’. Struggling with our ‘jar’ minds. Unless we step back and away, as my dad counselled me, and see that our whole Life is just an illusion, like a movie, we will continue to be miserable. Life happens. And keeps on happening. There were crises, there are crises and there will be crises as we go through Life. Each of those Life crises or tragedies or painful situations will leave us numb and confounded. The only way out, and the only way to find inner peace and happiness, is to stop identifying with anything or anyone. You are not your problems. You are not your relationships. Identification is the root cause of all misery. And the only way not to identify with anyone or anything is to simply witness Life. Be and behave like a third party. Then, through your awareness, you will discover that there was, is and never will be a crisis. What there always was, is, and will be, is happiness! Author AVIS ViswanathanPosted on December 29, 2013 March 14, 2016 Categories Amjad Khan, Art of Living, Bliss, Dharmendra, Happiness, Hema Malini, http://schemas.google.com/blogger/2008/kind#post, Inner Peace, Intelligent Living, Jaya Bachchan, Koan, Master, Ramesh Sippy, ZenLeave a comment on A goose in a jar, Jai’s death in Sholay, and a lesson in being happy! Immerse yourself in whatever you do to find bliss! When you do something from your inner core, for yourself, for your joy, you don’t have to work at all! Then work become a prayer, an offering of yourself to the Universe. Then what you do always delivers bliss unto you! So it is. Only what you do for yourself, and that which arises from within you, from your inner core, leads you to bliss. This is not the same as concentration. When you concentrate you are still employing a thought of getting something done. When you are simply doing, without employing any thought, but are becoming one with the doing, with the action, then work becomes worship and you experience bliss. This is the key. Not letting the mind to get dragged away in different directions. The human mind, on an average, thinks 60,000 thoughts daily. None of those thoughts often, on most days, pertain to what you are doing. Many of them are focused on the past__on remorse, guilt, anger, grief__and many, many more are steeped in worry, anxiety and fear of a future that is yet to arrive. This happens all the time. When you are drinking your morning coffee, when you are driving to work, when you are in meetings or even when you are talking to someone on the phone. Which is why most days have become dull, drab, monotonous, listless and boring! Which is why bliss seems so unattainable. Why, even happiness plays truant and you imagine you have to pursue it to find it! Make a simple shift this Sunday. Choose one activity. Maybe it is reading. Maybe it is spring cleaning your home. Or maybe it is gardening. Immerse yourself in it like Nan–in says, being silent, and simply doing that one thing. Don’t focus on getting it done. Just do it! Do it for 15 minutes. If you like it, extend it for another 15 minutes. Examine how you feel after this immersion session. That inexplicable feeling of peace, calm and happiness, is called bliss. Live a blissful Sunday today! Author AVIS ViswanathanPosted on February 24, 2013 March 14, 2016 Categories Abhimaan, Art of Living, Bliss, Hrishikesh Mukherjee, http://schemas.google.com/blogger/2008/kind#post, Inner Peace, Intelligent Living, Jaya Bachchan, Joy, Nan-In, Prayer, Work, WorshipLeave a comment on Immerse yourself in whatever you do to find bliss!